Steve Cummings makes it four stage wins out of seven for Team Dimension Data with an audacious – and classic Cummings – break from the breakaway to take stage 7 of this year’s Tour de France. With the main GC contenders content to let the stage unfold any which way, the winner was always going to come from the 29-man break. That Cummings took the race by the scruff with the climb of the Col d’Aspin and 26km to go just shows how much grit and heart this rider has. Daryl Impey (Orica-BikeExchange) and Daniel Navarro (Cofidis) rounded out the top 3 on the stage. This was a magnificent stage, probably because the GC contenders weren’t really in it, giving other riders a chance to battle it out and grab glory while the sun shone. There are two riders that deserve Rider of the Race so I’m going to talk about both of them. First up, the stage winner and breakaway revelation, Steve Cummings. Part of the massive break that was allowed to go, Cummings kept in the right group when it all started to splinter about 35km from the finish. All’s it took was one well-placed bit of road furniture (I don’t think I’ve ever thought that in a race!) for the TDD rider to get the gap that he would stretch to over a minute by the time he crested the Col d’Aspin. At first, it looked like Vincenzo Nibali – at first carrying 9-men on his wheel, including Navarro and Impey – might bring Cummings back, as at one point on the climb the gap had narrowed to under 20secs. But by the time Cummings crested the Col d’Aspin with over a minute in hand, His Nibs had been dropped by the Navarro/Impey duo and the only threat to his stage win was a bad descent. In other words, it was in the bag. His winner’s salute as he crossed the line solo was to kiss the bracelets on his wrists, made for each team member by kids helped by the Qhubeka charity. The group behind was obviously on the limit so I just carried on, as you do, and I was able to win. I am really happy for the team and thankful that they believe me. I hope that people are really starting to get that we are racing to put kids on bikes with Qhubeka, it just makes everything that much more special for us and has put the team on a high. 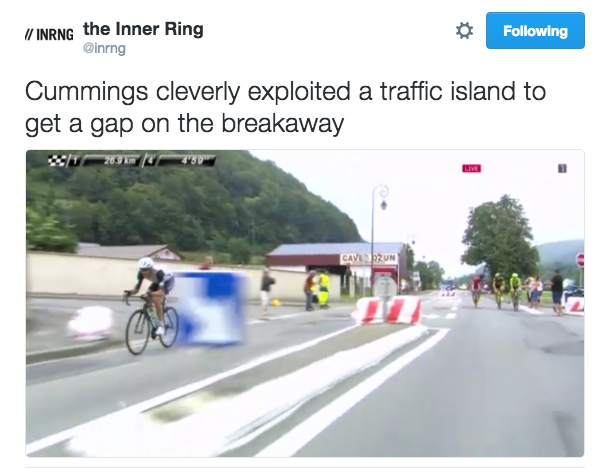 Of course, in the back of his mind, this might be a win that thumbs its nose at British Cycling, as it was announced a few days ago that Cummings was not selected for the Rio Olympics team because he lacked ‘commitment’. My other rider of the race is Greg Van Avermaet. Unexpectedly going into the maillot jaune yesterday with his own audacious solo win, he wasn’t about to let it slip from his shoulders on this stage and he decided to go into the break – I don’t think I’ve ever seen the yellow jersey in a break! – in order to try to get more time on the bunch. The GC teams seemed rather blasé about it all until they realised that the 5min-plus gap he had at one point in the race meant he could have finished 10mins ahead of them all by the end of the stage. That put a fire under them and though the Col de l’Aspin proved a bit too much for this Classics rider, he didn’t sit up and wait for the peloton when he was dropped from the slimmed down 9-man group on the slopes of the mountain. No siree! He kept his cool in the blazing sun and kept rocking and rolling up that mountain, riding with his heart as well as his legs. He came in 5th on the stage – not something anyone imagined – and put in another minute on the GC boys. 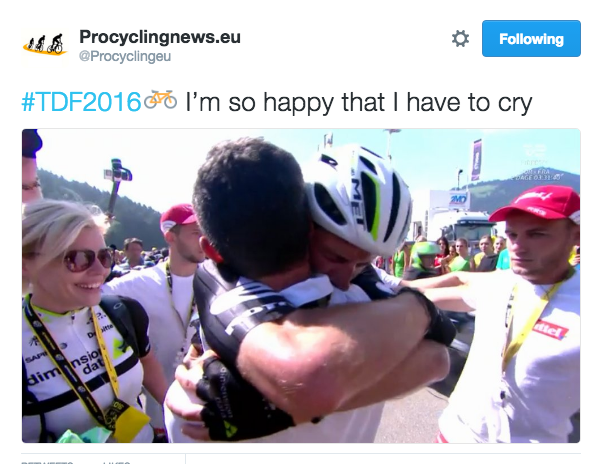 He might lose it all tomorrow, but today he showed what it means to wear the yellow jersey in the Tour de France. It means you never give it up without a fight. Both Mark Cavendish and Steve Cummings have talked about why Team Dimension Data are riding – and that is to support the Qhubeka charity in raising funds to provide 5,000 bicycles to recipients in Africa this year. For more information on what the charity is all about and the ways a bicycle really does change lives, go here. Whether you give a small sum, donate bikes, buy TDD kit, any and all support makes a difference. And spread the word. Let’s see if we can double or triple the number of bikes they’ll be able to provide by the end of this season. The flamme rouge decided that this was the stage that it would go rogue. You really can’t make this stuff up.